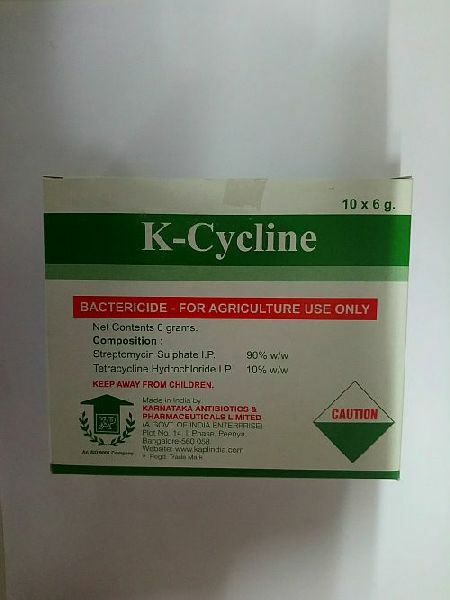 It is an antibacterial antibiotic formulation for effective control of the bacterial disease. Yellow coloured free flowing powder. Compatible with most commonly used Insecticides &Fungicides. Bacterial Disease Controlled : Bacterial Leaf blight of Rice, Black Spot in Chillies & Tomato, Black Rot in Cabbage & Cauliflower, Brown Rot in Potato, Leaf Spot in Cucumber, Angular Leaf Spot & Black arm in Cotton, Citrus Canker in Citrus & Bacterial Disease in Grapes, Sugarcane, Mango etc.